How about a trip to Mars? Wouldn’t it be great to view the sun set over your own settlement on the red planet? Or how about taking a stroll in the Gale crater around the original landing site of NASA’s Mars Curiosity Rover? For the first time this is now possible in Minecraft. GeoBoxers have converted real high resolution terrain data from various areas of Mars into Minecraft in scale 1:1. Go directly to the downloads or take a second to read what this is all about. Methane – a sign of life?! On December 16, NASA published an article about the detection of methane and other organic molecules in the Gale crater on Mars . The discovery indicates that life on Mars indeed is – or has been – a possibility. GeoBoxers salute these exciting news by opening a Life on Mars Minecraft server for a limited time period. 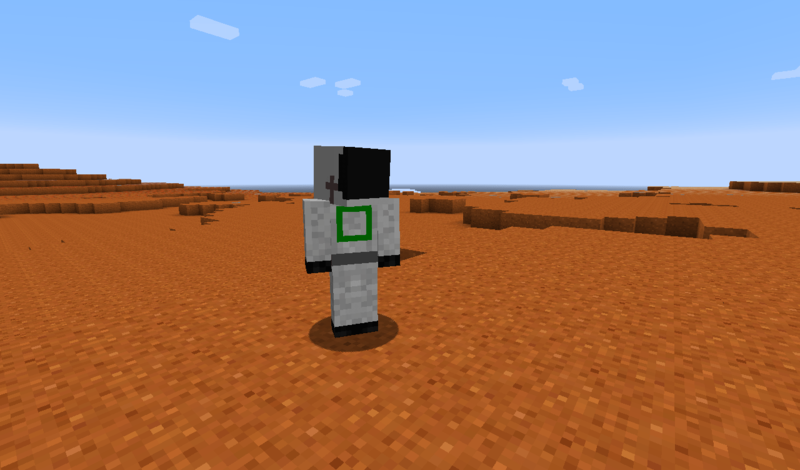 What can you do on Mars in Minecraft? You can choose to enter our server for a view of selected areas, or you can download the areas for use on your own computer. UPDATE: The server is closed, but you can still download the Mars-files. Give us a glimpse of your life on Mars. What does a Mars house look like? How will you survive? Livestock? Farming? Build it and share it using #geoboxers. Remember that on Mars the creepers come out at night! 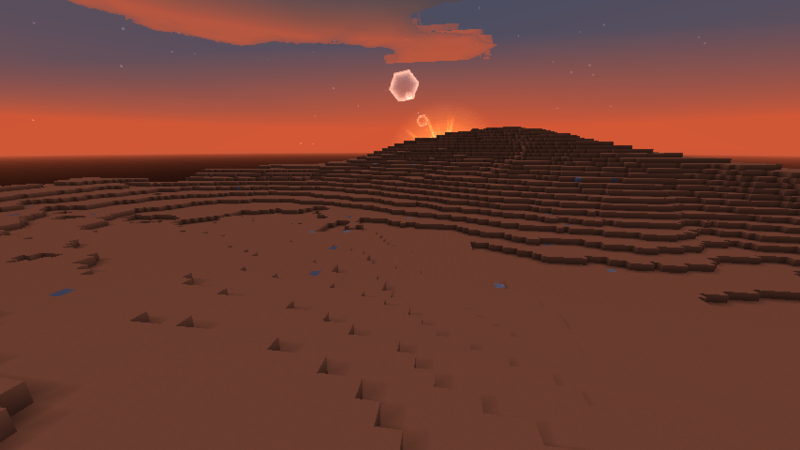 The surface of GeoBoxers’ Mars in Minecraft consists of red sand, gravel and scattered rocks. Below the surface there is dirt, different types of clay and rare deposits of different minerals. Scientists from NASA have recently discovered possible signs of liquid water on Mars’ surface . In GeoBoxers’ Minecraft models you will find water flowing in springs below the surface. Because of the low temperatures, it doesn’t rain on Mars, and clouds above Mars are thinner and higher in the sky than those seen in Minecraft. If you want to remove clouds, you can turn them off in your local settings. Mars is orbited by two small moons Phobos and Deimos – in Minecraft you will only see one moon at a time. The server UPDATE: The server is closed, but you can still download the Mars-files. The server is open for everyone to enjoy a view of Mars in Minecraft. All it takes is Minecraft running on a Mac or a PC (get Minecraft here: minecraft.net). You can move around – edits are by invite only. UPDATE: The server is closed, but you can still download the Mars-files. The different areas of Mars (app. 1600 m x 1600 m on the planet) are created as different worlds in Minecraft. Information on the single worlds can be seen on the download-page. When entering the server, you will spawn in the area around the original Curiosity Landing site. To move between the different worlds type /warp for a list of accessible warps, and type /warp <warpname> to move to the desired area. UPDATE: The server is closed, but you can still download the Mars-files. The server is only accessible to a limited number of players at a time, so we cannot guarantee access, we cannot guarantee against griefing, and data will be restored frequently. We encourage you to download the worlds and build offline or on your own server. Please, tweet screenshots to @geoboxers and use the hashtag #geoboxers. The server will be shut down on January 16, 2015. The surface of Mars is a hostile place for humans to stay. Variations in temperature are large, and generally it is (very) cold. The atmosphere is thin and mainly consists of carbon dioxide, and air pressure is much lower than on Earth. So, remember to wear a spacesuit. Download spacesuit. The HiRISE (High Resolution Imaging Science Experiment) is part of the MRO (Mars Research Orbiter) project where a satellite orbiting Mars collects huge amounts of wonderful data. NASA/JPL and University of Arizona have processed the HiRISE images and made very detailed measurements of the terrain into a digital terrain models (1 meter resolution… wow!). They have even been so kind as to let the public access the material here: http://www.uahirise.org. GeoBoxers have taken some of the digital terrain models and converted them to Minecraft worlds. To build and play Minecraft on Mars, we encourage you to download the worlds and build offline. Not only is Minecraft perfectly suited as a digital tool for true global collaboration across age, gender, social class, race and religion, it is also perfectly suited for interaction with real-world data like the terrain models of Mars. When looking at photos or maps from Mars you easily lose track of scale. There are no physical markers to indicate a certain known height. In Minecraft all blocks are 1m x 1m x 1m (or 3’x3’x3′) so the blockiness gives you a hint of the true size. Check out our galleries and other posts for inspiration on how to use real-world geography in Minecraft on Earth: https://www.geoboxers.com/vibcraft-viborg-in-minecraft/. All digital terrain models are provided by NASA/JPL/University of Arizona. Conversion to Minecraft format is performed by GeoBoxers. GeoBoxers are experts in geospatial data and situated in Copenhagen, Denmark. We excel in bringing large and complex geographical datasets into easy use as boxes and blocks in Minecraft. “Denmark in Minecraft” was a project launched by Geodatastyrelsen (Danish Geodata Agency), conceived, developed and operated by Simon Lyngby Kokkendorff, Thorbjørn Kjærshøj Nielsen and Nynne Sole Dalå, the founders of GeoBoxers.